Lots of beans and five mushrooms. Yes this is the contents of one whole bag. I’m already on the record as being a huge fan of Trader Joe’s Kung Pao Chicken frozen dinner – it’s the sort of cheap, yet easy to make, yet healthy, yet delicious meal that has you wondering why every frozen dinner can’t be this good. What it is: A bean, mushroom and chicken stir fry (frozen) – 22 oz. Worth it: It’s tasty, if you don’t mind all the beans. So when I spied Trader Joe’s (or should I say Trader Ming’s) new Shiitake Mushroom Chicken I was over the moon – surely TJ’s would be able to deliver the same top-shelf cooking with this chicken and mushroom stir fry, right? Well… maybe not. While I found the Chinese chicken dish edible, it’s not nearly as satisfying as its illustrious forebearer. The chicken and mushroom part is good enough (although we’ll get to them in a minute), it’s the unlabeled third ingredient that throws things off for me. For some reason TJ’s leaves “beans” off the label, even though soybeans (and green beans) make up the bulk of the dish. Of course, it’s understandable that you might not expect “Trader Joe’s Loads of Soybeans with Mushroom and Chicken” to sell quite as well – nevertheless that’s what you’re getting. Big and bright green, beans, beans, beans. I’ve got nothing against soybeans, or edamame as we usually call them in Asian cooking. I think a dish of salted edamame makes a nice little appetizer, and I even enjoyed Trader Joe’s Edamame Hummus. However, I find edamame to be much more of a support vegetable. Harder, more mealy and less savory than more common western beans like black or pinto, I don’t ask soy beans to carry a dish, and I don’t expect them to. Yet that’s what you get here, with each forkful of chicken laden down with a handful of whole soy beans. That’s a shame, because outside of the bean bonanza, the rest of the dish is basically on point. The soy-sauce marinated dark meat chicken is plentiful – and delicious – with the thick ginger soy sauce dressing included in the bag. Even better are the whole shiitake mushroom caps, which are as good as they are unorthodox. Generally the mushrooms you get in Chinese food (or most prepared meals) tend to be chopped up or button-sized. Not so here – each big honking shiitake mushroom cap is larger than a pre-war silver dollar, and served whole. As cool as that is, it’s tempered by the fact that you also only get about five or six of them in the whole bag. This combined, with the bounty of soy beans, makes for a weirdly unbalanced meal – spoonfuls of edamame and chicken, punctuated by the occasional whole mouthful of mushroom. It’s a good thing, then, that the mushrooms taste so damn great. These shiitake mushrooms are absolutely bursting with an intensely earthy mushroom flavor, saturating each meaty bite with savory good times. Overall, the feeling of the whole dish is sort of “Close, but try again.” All of the elements are just slightly out-of-whack with each other. If they took it back to the testing lab, cut down on the beans and added some more mushrooms, maybe halving or quartering them this time so you don’t have to, then they’d really have something. As it stands, there’s not just reason to get this dish instead of one of Trader Joe’s other, much better balanced, Chinese food offerings. Would I Recommend It: Yes, with reservations. Jut make sure you’re okay with beans going in. Final Synopsis: A bean-heavy take on a shiitake-chicken stirfry. I bought two bags, just in case I loved it. Well, I made the concoction last night and ate 1/3 of it. The chicken tasted completely artificial— like watery, compressed cardboard. The mushrooms were rubbery and oddly-flavored. I was surprised; I’ve never had a problem with TJ products. Unfortunately, I woke at 4 a.m. with “the trots.” My guts were telling me something I obviously was slow to grasp. I returned the other package today. 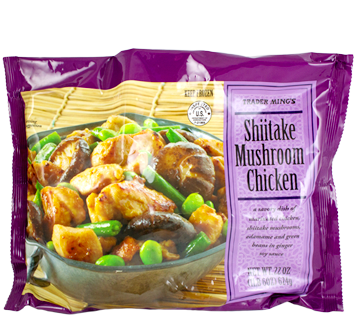 I just discovered Trader Joe’s Shiitake Mushroom Chicken, what a fantastic dish!! I love the dark meat chicken, it is tender and juicy. 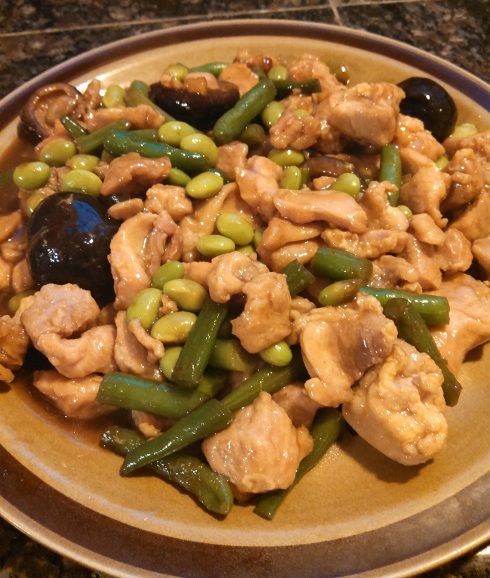 The REAL, ACTUAL Shiitake mushrooms, green beans and soybeans make the dish quite authentic, and the sauce is excellent, light so it doesn’t overwhelm the subtle flavors of the dish. Imagine all of this in a dish that is frozen and takes 3 to 5 minutes to microwave!!! I an so happy! This is delicious! Thank you Trader Joes! !